Single family home on almost 1 acre located on the Yellowstone River and the border of Yellowstone Park in Gardiner, MT. This newly renovated home has 3 bedrooms and 2 bathrooms. 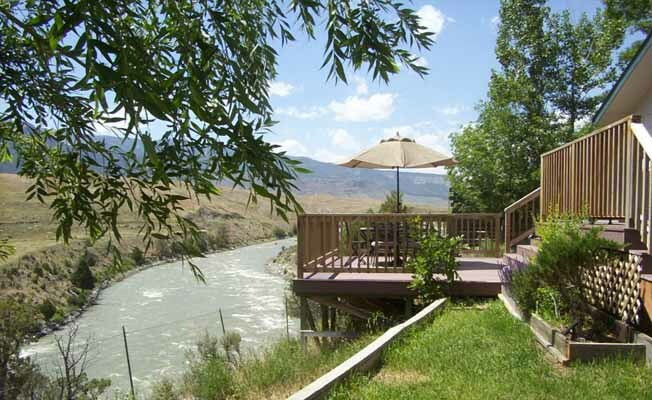 Enjoy your morning coffee on the deck over the Yellowstone River while spotting buffalo, elk, deer and antelope in Yellowstone Park across the river from this property. Fishing trips, rafting, kayaking and horseback rides are available in Gardiner. Restaurants, art galleries and shops are within walking distance. This house is only a few blocks from the North Entrance to Yellowstone Park, making it a wonderful base for day trips into the Park visiting Old Faithful, the mud pots, the Grand Canyon of Yellowstone, Yellowstone Lake and the famous Scenic Beartooth Highway. Gardiner is the original entrance to Yellowstone Park and the only year round entrance. Winter activities include animal photography, cross country skiing and snow coach tours or rent a snowmobile for touring in the Park. Downhill skiing is a day trip to Bridger Bowl.